If your business is growing, FORMost can meet your warehousing needs. When your business is growing, it is a major accomplishment to enjoy. However, when your growing business needs outgrow the efficiency of your distribution process, it can become overwhelming very quickly. If you’re not ready to upgrade your current set-up, or your increase is seasonal and does not merit a full change, outsourcing may be the best solution. FORMost can help you meet your warehousing and fulfillment needs this year. Perhaps the help you need goes a step beyond turnkey. FORMost professionals can help you decide on the right e-commerce solution for your business. We provide pick and packing service, where our professionals gather all the different items in an order and pack them up and ship them out. We also provide kitting services, where you preassemble your materials, and we ship them out for you. A kitting service is a great option if you’re shipping the same thing (like a promotional package, sample kit, or catalogs) each time, rather than varying items. Either way, you will be spared one less stress, as our mission is to get your shipments out efficiently and to pack your items as carefully and accurately as you would yourself. The package will look how you want it to and be addressed appropriately. We know that the packages you send need to speak for and protect your brand and our job is to make sure that is done efficiently for you. The right fulfillment partner will provide the tools to make sure your shipments go out efficiently and on time, looking the way you want. They should offer excellent customer service, competitive postal rates, and innovative technology, without destroying your budget. FORMost warehousing and fulfillment professionals can help you decide what you need in a turnkey fulfillment service, so you are entirely satisfied with the outcome. 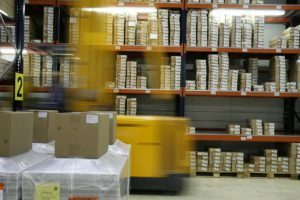 If the major thing holding you back from using a warehouse and fulfillment service is not being able to personally see and track your inventory, we can help with that too. We have modern and customizable tools to help you manage your inventory. We offer logistics coordination and full package tracking, so you always know where your shipments are, both in the packing process and geographically after they leave our location. We produce sales reports and reorder notifications, so you always know your inventory levels. If your products are something that we can produce, we will even take care of the reordering for you. FORMost Graphic Communications proudly provides high-quality print and marketing solutions that produce results for your business. Since 1985, we have been providing an array of services for both national and international clients across a wide variety of industries, including all levels of government. As a privately-held company based in the Washington DC area, we are dedicated to providing exceptional services and products to each of our clients unique marketing needs. To learn more about our products and services for your marketing and print needs, contact us today at 301-424-4242, or visit us on Facebook,Twitter, or Linkedin for more information. This entry was posted on Friday, November 30th, 2018 at 2:09 pm. Both comments and pings are currently closed.